In its 2017 Transit Survey, transit communication systems developer ETA Transit found that 75% of North American transit agencies’ ITS solutions are still housed on a local server and that 85% have considered migrating to a cloud-hosted service. The reasons agencies are finding cloud-based systems more appealing are many, but chief among them is the high cost associated with maintaining their current server systems and the ability to continually make upgrades to the system to keep up-to-date with all the latest features and solutions ITS providers can offer. An even bigger reason, though, is the growing trend to integrate public transportation with other modes of transportation, using open application program interfaces, so users can more easily plan complete trips that may only use public transportation for part of their trip, as well provide more accurate real-time vehicle information on the agency’s website, smartphone, or signage. METRO took a look at some of the latest ways tech providers are integrating more options to help transit agencies take advantage of cloud-based open architecture to improve their offerings to passengers and improve efficiencies. Syncromatics offers a suite of cloud-based solutions, including automatic passenger counting, real-time passenger information, and web-based annunciation systems. Starting out in university operations 10 years ago, Syncromatics now focuses on small and mid-sized transit agencies. Bringing “big city technologies” to smaller and mid-sized agencies, the company brings back-end solutions to help agencies run more efficiently as well as provide real-time bus arrival info via easily branded websites, apps, and signage. Deviating from its typical focus, Syncromatics recently landed a $4 million contract from the Los Angeles County Metropolitan Transportation Authority (Metro) to design, install, and operate a network of 300 real-time bus information signs at the busiest bus shelters across Los Angeles County. The electronic signs, the first to be deployed widely in the Metro bus system, will provide real-time arrival times, service alerts, and other information about Metro buses, as well as those operated by other regional transit agencies that share bus shelters. Metro teamed with Syncromatics for the signage project after a survey found that more than 60% of the agency’s riders do not own a smartphone. “The signs will not only bring real-time arrival info to those without phones, but will also enhance the rider experience for those who do,” says Fay. The new signs, which include a back-end software system that will be able to provide the agency updates on device health and possible power outages, will feature text-to-speech technology to make audio announcements for visually impaired riders, and roughly 100 locations will include solar panels to eliminate any impact on the electric grid. That text-to-speech technology is another important feature Syncromatics is adding, not only to meet ADA requirements, but also to do such things as send service alerts or promote community events in spoken form directly to the bus, without driver intervention. The Los Angeles County Metropolitan Transportation Authority (Metro) board of directors today awarded a $4 million contract to Syncromatics to design, install, and operate a network of 300 real-time bus information signs at the busiest bus shelters across Los Angeles County. The electronic signs, the first to be deployed widely in the Metro bus system, will provide real time arrival times, service alerts, and other information about Metro buses, as well as those operated by other regional transit agencies that share bus shelters. Improving the bus rider experience is a top priority for Metro. The new signs will feature text-to-speech technology to make audio announcements for visually impaired riders, and roughly 100 locations will include solar panels to eliminate any impact on the electric grid. "Live bus arrival times and service alerts remain out of reach for the 62% of Metro who don’t own smartphones," said Board Member and Los Angeles City Councilmember Mike Bonin, citing an internal Metro survey. "Bringing real-time information to the bus stop is a common sense technology solution to an age-old problem, and it will improve the transit experience for all." As the prime contractor for the project, Syncromatics is responsible for the design, permitting, and construction of the signs, including providing electric service to many locations that currently lack power. Syncromatics will provide data management services to process real time and scheduled bus arrival times for thousands of vehicles and distribute the information to the electronic signs over the cellular data network. The company’s software will also allow for dynamic messaging on signs to inform transit users of delays, detours, and special events. Spread across more than 25 cities, the phased roll out of new electronic signs will be completed in 2018. Syncromatics, today, announced its acquisition of Mobilitat, whose Easy Rides dispatch and scheduling software enables demand responsive public transportation. Easy Rides will join Syncromatics’ existing portfolio of fixed route technologies offering comprehensive solutions for public transportation operators. Syncromatics and Mobilitat have been collaborating for over a year in a non-exclusive partnership to provide technology solutions for transit agencies requiring both fixed route and paratransit software. The acquisition builds on this successful track record and will enable closer coordination of technology development and marketing efforts. Cindy Johnson, the founder and CEO of Mobilitat, will become the president of Syncromatics’ newly formed Demand Response Division and join the Syncromatics Board of Directors. Syncromatics will retain all Mobilitat employees and the company’s Wyoming office to ensure continuity of service to all Easy Rides customers and to accelerate the development of new products. The first newly integrated product resulting from the partnership is Open MDT, a Mobile Data Terminal that can seamlessly switch between fixed route mode and demand response mode. This flexible design enables transit agencies to provide more rides with fewer spare vehicles to reduce overhead costs. Open MDT can also run third-party apps on the Android operating system to extend its functionality and ensure a “future proof” technology platform. The deal closed at midnight on Monday, August 15 for an undisclosed amount. In addition to delegates and elected officials, California also sent an important piece of technology to the Democratic National Convention (DNC). Los Angeles-based Syncromatics’ bus tracking technology played a key role for the team that provided safe and reliable transportation to delegates, media, and VIP guests at the DNC in Philadelphia. The Democratic National Convention Committee turned to Event Transportation Associates (ETA) to implement a temporary transit system capable of moving people from hotels scattered around the city and New Jersey to various convention sites. As a contractor to ETA, Syncromatics provided computer aided dispatching and automatic vehicle location software as well as a real time passenger information website so delegates could quickly check the location of their bus and transit time to their convention venues. In the span of only 48 hours, Syncromatics installed GPS tracking devices on the fleet of more than 400 buses sourced from over 20 private and public fleets in the area. Syncromatics also provided web-based dispatching technology to power the central bus operations command center and feed data to the City of Philadelphia’s Emergency Operations Center. More than just dots on a map, the Syncromatics software provided route based assignments for each vehicle, enabling dispatchers to anticipate service disruptions and take proactive measures to ensure passenger safety and troubleshoot potential issues. In addition to behind the scenes dispatching, Syncromatics hosted a public website to enable convention attendees to track their buses in real-time. The mobile responsive website garnered more than 10,000 users during the week of the convention. "C5LA was founded in 1999 as the personal philanthropy of John Alm, former President and CEO of Coca-Cola Enterprise. After years of sending his own children to summer camp, John saw the impact that it had on their lives, helping them develop personal skills, confidence, and improved self esteem. The camp experience was an amazing lesson in life for all that were fortunate enough to attend. Unfortunately, those children who could benefit the most from such programs were unable to afford such an experience. With this in mind, John and his wife Carolyn began their mission with the idea of providing not only a camp program, but also a leadership development and life preparatory experience to those who simply had no access to such opportunities. After bringing his initial dream to reality, C5LA has grown in scope from a four week summer camp to what is now a 5 year, year-round Leadership Development and College Preparatory Program. Since the inception of the program, John Alm and the Los Angeles program have inspired others to expand C5 which now serves youth in four other cities across the United States. The mission of the C5 Youth Foundation of Southern California, is to change the odds for high-potential teens from under-resourced communities by inspiring them to pursue personal success, while preparing them for leadership roles in school, college, work and their communities. How is technology changing the face of cities and public transportation? At the Transit Tech Summit, we came together to discuss the latest technology developments affecting transit managers and riders. Round table discussions popped up with our peers in public transit that allowed us to share what works and what doesn't. The afternoon mini-conference wrapped up with a hosted networking reception that exposed us to vendors, customers, partners and friends in a more intimate setting. There's an App for That - How do I Get an iPhone/Android App for my Bus System? Hooray for Real Time Info at Big Blue Bus – But Now What? The LA Cleantech Incubator is Los Angeles’ new innovation hub – a place where entrepreneurs, engineers, scientists and policymakers can collaborate to design the future of cities. The Campus features offices, conference rooms, R&D labs, prototype manufacturing workshop, training center, and event space directly adjacent to the new Arts District Park. The incubator is a beacon of green technology, featuring a 175 kilowatt photovoltaic solar canopy, greywater filtration, bioswale, and microgrid systems, all in the heart of LA’s Arts and Innovation District. Great news from The Bus, Merced’s Regional Transit Authority, which has announced the addition of free Wi-Fi on board all buses. The state-of-the-art 4G network has been installed on all fixed-route and paratransit buses servicing Merced County. Riders now have the convenience of checking e-mail and chatting on social media during their commute. The addition of a high speed Wi-Fi network is just the latest in improvements made to the service. In the past year, routes and schedules have been streamlined to make service faster and more convenient for passengers. New stops have been added, weekend service hours have been extended and security monitors have been added to all buses. The Bus has expanded its service area with the addition of direct routes from Los Banos to Merced and Los Banos to Turlock. Efforts have also been made to improve passenger communication. Bus stops are now clearly marked with signs, taking the guesswork out of riding the bus. The website has been redesigned to provide riders with more comprehensive information. Passengers have instant access to real time maps, arrival times, fare information and news alerts via “thebuslive.com”. The Bus, Merced’s Regional Transit Authority, is the single public transportation service provider for all of Merced County, serving the communities of Atwater, Dos Palos, Gustine, Hilmar, Le Grand, Livingston, Los Banos, Merced, Planada, Winton and also Turlock. The Bus is dedicated to delivering quality, affordable transit services that link people, jobs and communities. The Bus strives to provide increased mobility to the transit-dependent population by offering cost-effective, safe and efficient service to the residents of Merced County. GMV and Syncromatics Corp, a leading U.S. Software as a Service (SaaS) provider of advanced bus tracking, CAD/AVL, and real-time passenger information solutions, are pleased to announce today that have signed an agreement for a strategic investment in Syncromatics. As part of GMV’s growth and international expansion strategy, the U.S. market is considered top priority. Running a Space and ICT subsidiary in the U.S. since 2004, GMV had identified the U.S. public transportation market as one with great growth potential. In this context Syncromatics offers an excellent approach to this expanding market, enabling the company to grow rapidly in North America. Syncromatics has an outstanding track record and is highly appreciated by all its clients; moreover, it has a highly qualified management, commercial and technical team that knows the North American market very well; this gives GMV an excellent footing for future growth. Additionally it has a technological offer that is perfectly suited to the U.S. market and is complementary with GMV’s present portfolio. This agreement will also generate significant commercial, technological and operating synergies in the future, enhancing growth and value creation for GMV within the U.S. and elsewhere in the world. Syncromatics, for its part, will benefit from GMV’s experience, complementary technologies and products and financial resources. With this strategic investment, Syncromatics will now have the resources to accelerate growth and become a market leader in the U.S. Founded in 2006, Syncromatics provides a range of advanced CAD/AVL, real-time passenger information and passenger counting solutions to more than 40 customers in the U.S., among them the Los Angeles Department of Transportation (LADOT). Bus shelters are one of those city fixtures that we hardly notice until we need them. I know I'm always grateful for the shade and seat a shelter provides while I'm waiting for my ride. Until now, these shelters have dutifully performed their job: give people a place to recharge until they move to their next destination. But imaginative people in the City of Los Angeles and at Outfront/JCDecaux Street Furniture are seeing the greater potential of bus shelters as technological service providers. The modest shelter can also be a place to recharge, literally, with USB charging stations for your mobile devices. A shelter can also be a source of light with low-energy LED lighting powered by the sun. A shelter can also be a helpful companion that will let you know what buses will arrive when to take you to the myriad destinations served by LA's ever expanding public transportation options. For those with vision impairment, the shelter has an audio interface which will read the bus schedule to you at the press of a button. The shelters will integrate the schedules from both LA Metro and LADOT DASH through the efforts of the agencies and Syncromatics, the company that makes it possible to know exactly where the DASH buses are. By providing free Wi-Fi, the shelters will connect your mobile devices with the Internet; and small, broadcast-only Bluetooth radio beacons have the capacity to work with opt-in apps and future innovations to turn your phone into a local guide-- and more. This combination of features turns the shelter into what the tech crowd might call, "a platform capable of unlocking future innovations that we can barely imagine." That might sounds like an overstatement, but it's true. This is 21st century technology at work--fundamentally improving customer service across our city. The Central Arkansas Transit Authority officially transitioned to its new name, Rock Region METRO, Tuesday, implementing a new brand to match the adoption of a new service plan. The Rock Region METRO brand is one of the major recent outcomes of the Move Central Arkansas project, a comprehensive planning effort involving a variety of stakeholders in public transit. The new brand will support a service plan recently adopted by the Rock Region METRO board of directors. The plan focuses on three key areas: service expansion and improvements, comprehensive and consistent branding and exploring funding opportunities to support the former. The rebranding process will continue for the next seven months. Immediate changes can be seen on the organization’s website and social media pages, rrmetro.org, Facebook.com/rrmetro and @rrmetro, respectively; on new signage at streetcar and bus shelters and on signage at the River Cities Travel Center, 310 E. Capitol Ave., Little Rock. New bus stop signs sporting route numbers and a customized texting system based on stop locations will appear in September. 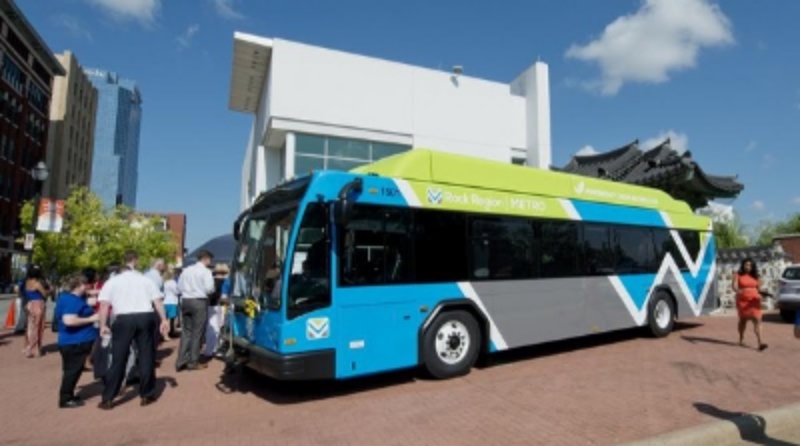 The most visible aspect of the rebranding initiative can be seen on the fleet’s 15 new compressed natural gas-fueled buses, which will start service Wednesday, Aug. 12. Older vehicles in the fleet will be rotated out of service now through March and painted to match the brand’s new look. By the end of 2025, the entire Rock Region METRO heavy-duty bus fleet will be replaced with the new CNG-fueled bus models. Passenger service improvements are being planned for the near future. Starting Wednesday, Aug. 12, all fixed-route and express buses will offer passengers free WiFi. The METRO Tracker GPS-based mobile app is in beta testing and will debut in September. A digital screen added to the River Cities Travel Center will display bus departure and arrival times once the METRO Tracker app debuts and will provide an announcement service in the interim. Finally, Rock Region METRO will add 35 new bus shelters across its service area by the end of the year. The new Rock Region METRO name and brand was developed by the San Francisco-based firm Nelson\Nygaard Consulting Associates, an internationally recognized firm specializing in transportation systems development. In his freshman year, Josh Bigelow, B.S. ’06, took a job as a USC campus cruiser driver to make new friends. But he quickly found he was driven to do much more. Bigelow, who at 13 taught himself to write computer code by reading a book, soon concluded the cruiser’s dispatch system needed an overhaul. It made no sense, he thought, for supervisors to call him and other drivers with names and addresses of people who needed rides when technology existed to streamline the process. Nothing if not ambitious, Bigelow told his bosses that he could build a better system. Go ahead and try, they responded, somewhat incredulously. Drawing on what he calls his “considerable amount of self-taught engineering experience,” along with knowledge acquired at the Stanford University computer science summer camps he attended in high school, Bigelow spent six weeks producing a new-and-improved system. Instead of providing drivers with passenger coordinates over the phone, dispatchers could now communicate that information by text, which showed up on newly installed mobile data terminals. Bigelow’s system also leveraged GPS technology to allow supervisors to remotely track vehicles and make changes to routes as needed. Bigelow, who graduated from USC Viterbi with a dual degree in computer engineering and computer science, has leveraged that on-the-job training to build Syncromatics, a multimillion-dollar Los Angeles-based transportation company. The growing firm counts the Los Angeles Department of Transportation, the University of South Florida and Merced County, Calif., among its 33 customers nationwide, with more than 1,000 buses in service. Syncromatics’ system benefits both riders and transit agencies. Passengers can access arrival times from their smartphones that tell them bus location and estimated arrival times. Bus operators receive real-time information about schedule performance, ideal spacing between buses and ridership numbers via infrared passenger counters. Dispatchers can also send texts to buses that voice annunciation software translates into verbal announcements. Bus fleets that use Syncromatics’ technology have seen ridership increase because of better on-time performance. More people on buses means reduced fuel consumption and emissions. He also revered the printed word. An avid reader, Bigelow consumed history, philosophy and computer science books, always challenging himself intellectually. The lessons of John Wooden resonated, especially the late great basketball coach’s “Pyramid of Success,” with its emphasis on poise, initiative, industriousness and self-control. Bigelow took those qualities to USC. Although he learned much in the classroom, Bigelow said much of his education took place during his hands-on training at USC Transportation. Based on the technology he developed in his dorm room at USC, Bigelow founded Syncromatics in 2006. (The company’s name is an abbreviation of “synchronized telematics.”) At the time the firm’s sole employee, he quickly secured a $100,000 contract with the University of California at San Diego. Within a year, he won the prestigious Lexus Transportation Prize in the California Clean Tech Open. Bigelow took home $50,000 in cash and $50,000 in in-kind services, including free office space and legal services. He parlayed that newfound credibility into a meeting with LADOT’s chief of transit, who told him about the city’s problems with “bunching” of the downtown bus fleet, which made some vehicles arrive early and others late. Bigelow, sensing an opportunity, offered a free 15-bus pilot to try to address the problem. Syncromatics’ vehicle tracking system did the trick, winning the company a lucrative contract. Syncromatics’ business with LADOT has only expanded since then, as has the suite of services it offers. Today, Syncromatics oversees 308 city buses, including the Hollywood and Downtown DASH lines. Bigelow expects sales to double in the next couple years. “He has that entrepreneurial spirit, that grit and persistence, that X factor,” said Ashish Soni, the founding director of the USC Viterbi Student Institute for Innovation, or VSI2, who taught Bigelow at USC and serves as an informal adviser. Bigelow is proud of his and Syncromatics’ successes. Now the company’s chief strategy officer, he readily shares credit with his team. More than anything, though, Bigelow says he is grateful to USC Viterbi. “Viterbi gave me the training of a professional engineer, the business savvy of a USC graduate, the on-the-job experience of the transit industry, and a vital network of friends and colleagues that has served in more ways than I could list, both personally and professionally,” he said.